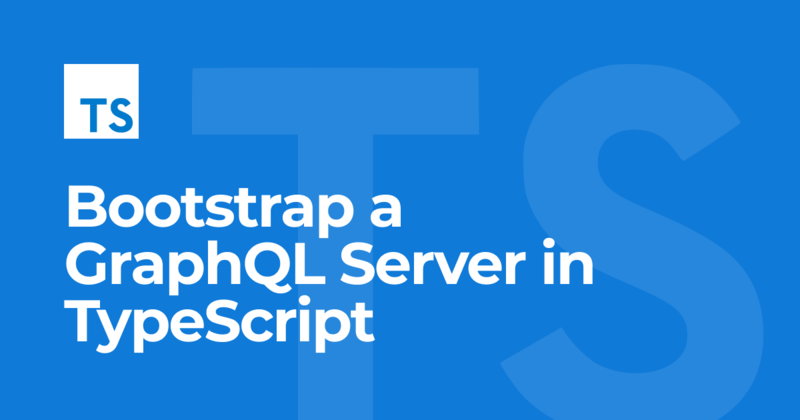 In this tutorial, you'll learn how to build a GraphQL server with TypeScript. You will use graphql-yoga as your web server. The server is connected to a Prisma database API using prisma-binding. To learn more about the core concepts of GraphQL server development with Prisma and the architecture, read the corresponding Introduction chapters. The code for this project can be found as a GraphQL boilerplate project on GitHub. Throughout the course of this tutorial, you'll use the Prisma CLI to create and manage your Prisma database API. You'll also use the GraphQL CLI for certain workflows around your GraphQL server. You'll now bootstrap the code for your GraphQL server using the graphql create command from the GraphQL CLI. my-app: This is the directory name where the CLI is going to put all files for your project. --boilerplate typescript-basic: This specifies which GraphQL boilerplate you want to use as a starter kit for your GraphQL server. 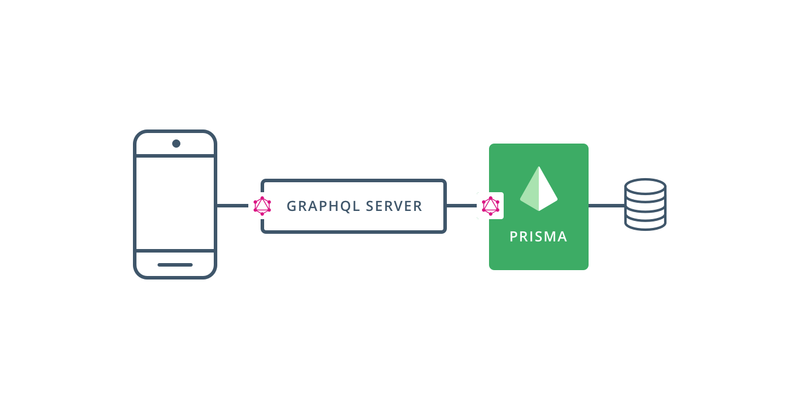 After graphql create has finished, your Prisma database API is deployed and will be accessible under the endpoint that's specified in /my-app/database/prisma.yml. .graphqlconfig.yml GraphQL configuration file containing the endpoints and schema configuration. 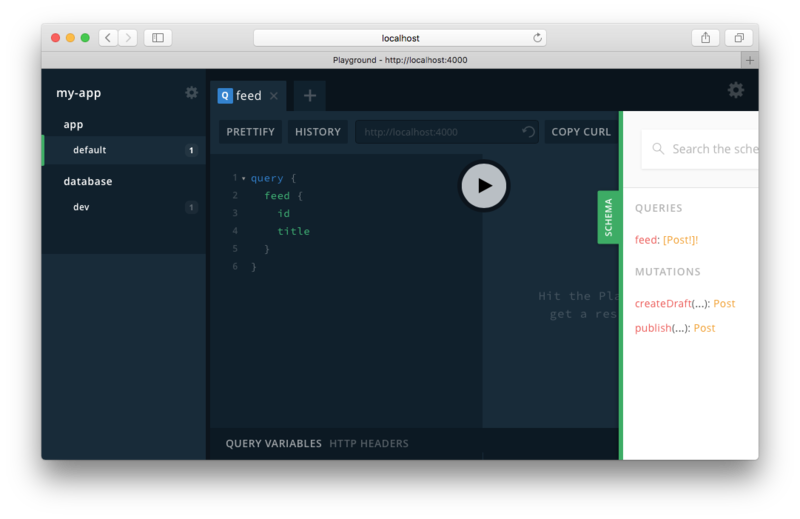 Used by the graphql-cli and the GraphQL Playground. See graphql-config for more Steprmation. 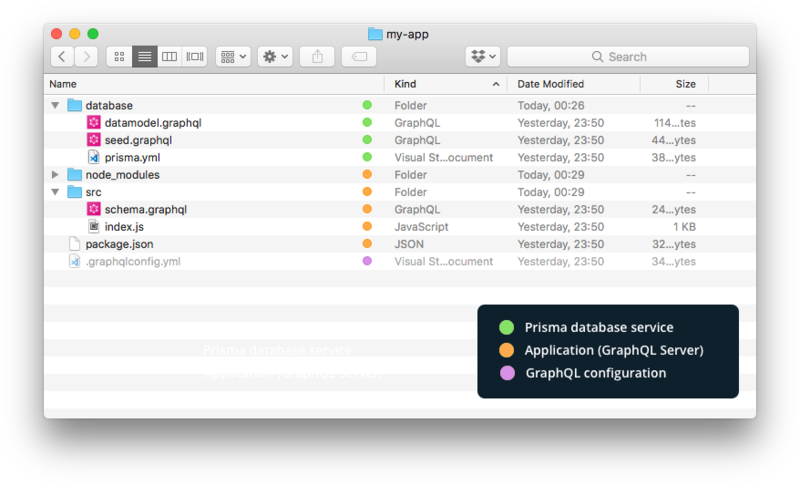 database/prisma.yml: The root configuration file for your Prisma database API (documentation). database/datamodel.graphql contains the data model that you define for the project (written in SDL). We'll discuss this next. database/seed.graphql: Contains mutations to seed the database with some initial data. src/schema.graphql defines your application schema. It contains the GraphQL API that you want to expose to your client applications. src/generated/prisma.graphql defines the Prisma schema. It contains the definition of the CRUD API for the types in your data model and is generated based on your datamodel.graphql. You should never edit this file manually, but introduce changes only by altering datamodel.graphql and run prisma deploy. src/index.ts is the entry point of your server, pulling everything together and starting the GraphQLServer from graphql-yoga. Most important for you at this point are database/datamodel.graphql and src/schema.graphql. database/datamodel.graphql is used to define your data model. This data model is the foundation for the API that's defined in src/schema.graphql and exposed to your client applications. Based on this data model Prisma generates the Prisma database schema, a GraphQL schema that defines a CRUD API for the types in your data model. This schema is stored in src/generated/prisma.graphql and will be updated by the CLI every time you deploy changes to your data model. The TypeScript type definitions for the Prisma database schema are auto-generated using the graphql prepare command from the GraphQL CLI. They're stored in src/generated/prisma.ts. Invoke the dev script that's defined in package.json. It will start the server and open a GraphQL Playground for you. Note that each Playground comes with auto-generated documentation which displays all GraphQL operations (i.e. queries, mutations as well as subscriptions) you can send to its API. The documentation is located on the rightmost edge of the Playground. Once the Playground opened, you can send queries and mutations. The GraphQL API defined by your application schema (src/schema.graphql) can be accessed using the app Playground. If you now send the feed query, the server will still return an empty list. That's because feed only returns Post nodes where isPublished is set to true (which is not the case for Post nodes that were created using the createDraft mutation). You can publish a Post by calling the publish mutation for it. The GraphQL CRUD API defined by the Prisma schema (src/generated/prisma.graphql) can be accessed using the database Playground. As you're now running directly against the database API, you're not limited to the operations from the application schema any more. Instead, you can take advantage of full CRUD capabilities to directly create a published Post node. title: "What I love most about GraphQL"
text: "That it is declarative." The Post node that was created from this mutation will already be returned by the feed query from the application schema since it has the isPublished field set to true. In the database Playground, you can also send mutations to update and delete existing posts. In order to do so, you must know their ids. With this mutation, you're updating the text from That it is declarative. to The awesome community.. In this quickstart tutorial, you learned how to get started building a GraphQL server using TypeScript with Prisma as a "GraphQL ORM". If you want to learn about how the Prisma database layer actually works, you can check out this tutorial in our docs. Learn how to deploy the GraphQL server with Zeit Now or Apex Up. Learn how to build a fully-fledged GraphQL server with authentication, pagination, filters and realtime subscriptions in this in-depth Node & GraphQL tutorial on How to GraphQL.